Professor Winn’s 15 Habits of Highly Successful TOEFL iBT® Candidate is the perfect companion for your TOEFL® exam preparation. Make the most of your TOEFL® iBT preparation – learn these 15 habits for a high score on the exam. Each habit is drawn from my own decade of experience teaching English and more importantly TOEFL® and IELTS preparation. Plan to take the TOEFL® test only once and move on with your life! Adopt these 15 habits now and start preparing for the exam in a more efficient way. Build both English-language and TOEFL® skills needed to help you do your best on the exam. Gain confidence during your TOEFL® test preparation with these insights to present the exam only once. Then, start living your new future. Access the Extra Resources File for a huge list of resources to boost your exam prep at home or work. Be ready to use the “hidden skills” you need to save time for you to answer more test questions. Learn the best move you can make today for success on the test. You know how important a high TOEFL® score helps you reach your personal and professional goals. 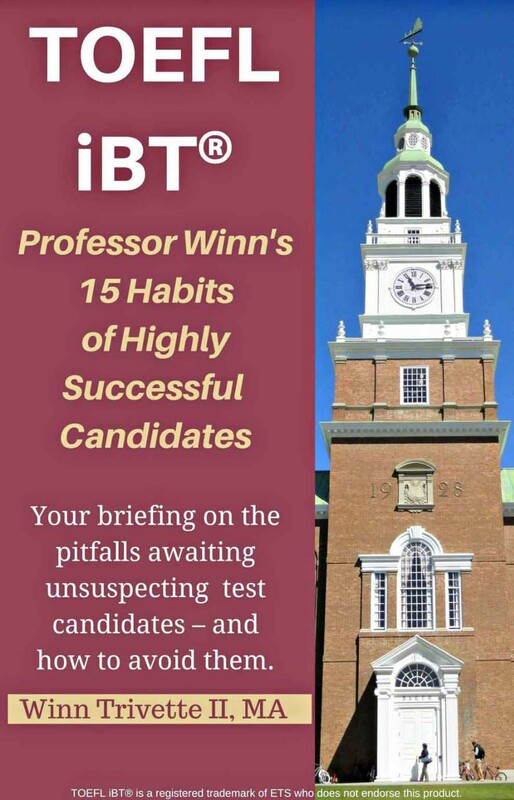 Get Professor Winn’s 15 Habits of Highly Successful TOEFL iBT® Candidates today!